Run, Bike, Hike, WorkOut, Be Great & Look Great Doing It! With SlimClip Case you can clip your phone to your waist and do all the things that make you great without compromising on function or your style. You don't have to grip your phone in your hand, bra stuff your phone, deal with a bulky & awkard armband, or place your phone down on the gym floor and hope for the best when you workout. When you're not working out, you don't have to look like your "packing", clip your phone without the bulk of traditional clip cases & don't compromise your style. NEW Packaging & Product Delivery Experience! Even Better! 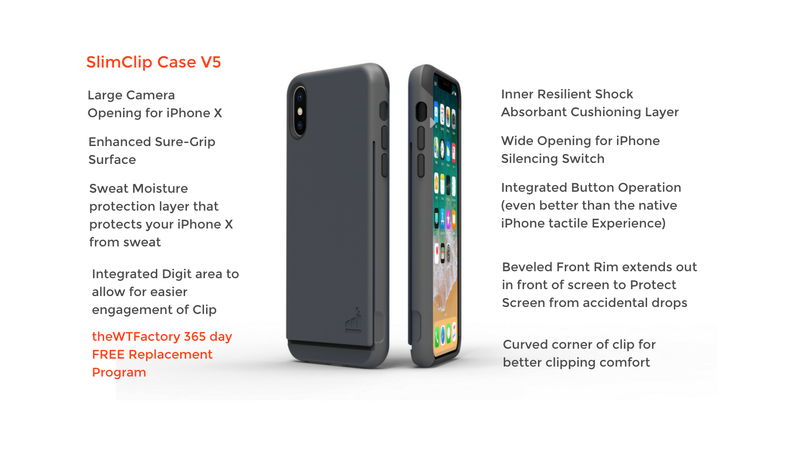 What iPhone sizes does SlimClip Case V5 fit? How does the 365 day replacement plan work? If for any reason, SlimClip Case breaks or stops functioning properly within the first year of use – contact us and we will send a return label and another SlimClip Case at no cost to you if it’s a domestic purchase. Does the SlimClip Case actually stay on while I workout and run? Yes. Emphatically, Yes! The SlimClip Case is awesome at staying on while you Run, Jump, WorkOut, Flip, or whatever else you want to do. What if I want to return it because it doesn’t work for me? This is extremely unlikely if you like taking your phone along with you while you run or workout. That being said, contact us within 15 days of receiving SlimClip Case, and we will send you a return label and a full refund upon receipt of the return. Will SlimClip Case X work with wireless charging?